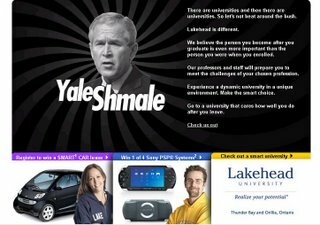 You would think that a Canadian College could think of some other recruiting tool than to bash US President George W. Bush? 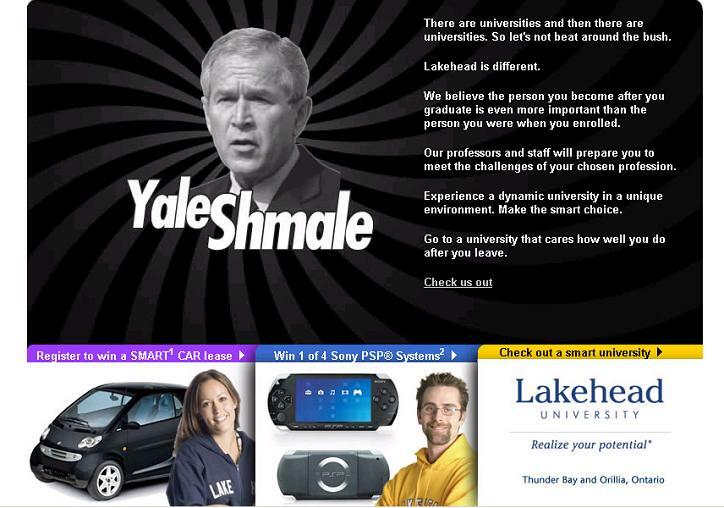 Lakehead’s not so clever “Yale Shmale” campaign. The university has issued posters bearing the black and white image of Mr Bush, who graduated from Yale in 1968, encouraging people to visit its campaign website. The university has defended its campaign, which also includes prizes of a car lease and handheld computer games consoles, saying it has had a positive effect. “It was literally a tongue-in-cheek way of getting attention,” university president and vice-chancellor Frederick Gilbert told Reuters news agency. The website had received more than 7,000 hits, he said on Monday, and online comments had been 95% positive. But he acknowledged the university had received e-mails which were “running in the opposite direction”, which was a concern. “Older generations” and some of Lakehead’s students considered the campaign inappropriate, he said. The university would not retract its campaign, however, although it would try to respond to individual concerns, he said. Amazing! These Institutes of Higher Indoctrination don’t even try to hide their Leftist leanings anymore! How weak! Rather than a campaign against the real villians of our time, this college in the tundra attacks the man responsible for freeing over 25 million persecuted women, kept the US safe from another devastating Islamo-fascist attack, and brought the US economy out of the 9-11-Post Clinton recession. Sad. First of all, even in Canada it’s hard to believe anyone would think that mocking a Republican president’s intelligence is “bold and edgy.” Even funnier is Gilbert’s misuse of the word “literally.” We guess being president and vice-chancellor of a rugged Canadian university doesn’t necessarily mean you’re smart either.